Davos for me was always skate and ski record, Thomas Mann’s Magic Mountain, a community devoted exclusively to sickness but also a book that pulses with life in the midst of death. It took place in a sanatorium in the late 1800s when tuberculosis was at its worst. In recent years the Davos talks were “power elite gathering place” where politicians, bankers, industry representatives and celebrities as Bill Gates, Desmond Tutu, Angela Merkel and Richard Branson showed up and prophesied a bit about the future but also made ​​some wise decisions. Is it a conference or a spectacle in which all that matters is to be, it feels like as if you’re not here, you are not, can this be so? Going to Davos, one of my dreams came true when I was invited to go there a couple a weeks ago. It has always been a special place for me, not least for The Davos Economic Talks. Now I am going there to attend the World Resources Forum where I will talk about Waste Prevention and give some good examples from all over the world. Davos is like a street, a street where everything is close and cozy, I love the altitude and the alp air, you feel a little smarter when you are here, I don´t know why. Maybe because of all the brain capacity that´s been here before me, no other comparison. I flew Goteborg – Paris- Zurich, then the train Davos, missed a train in Landquart and had to spend 6 h waiting for the morning train, I knew this village after being there, walking the streets. World Resource Forum is a conference that is technical but also has some good speeches, about behavior and the socio perspective. The opening was great and I learned a few new words like gamification (using game elements in a non game context), shamification, making sustainability fun and rewarding not punishing. And many more seminaries, plenaries and workshops. The International Zero Waste Alliance (ZWIA) had a great workshop with speakers from all over the world, like Richard Anthony (USA), Joan Marc Simon (Spain), Jack Macy (USA), Pål Mårtensson (Sweden), Rodrigo Sabatini (Brazil), Tom Wright (USA), Jessica Sabatini (Brazil), and Tom Wright (USA). It was all about finding a smart and good way to end the waste problem which is the same all over the world. We need an international convention on sustainable resource use and we need to stop burning or bury resources as we do today, everybody knows this but the action programs are not coming through. Pollution of the air, water and land can never be an accepted practice anywhere in the world – it has to stop and it has to be stopped with intelligence and smartness, let everybody participate to do well, because everybody matters when it comes to waste management. 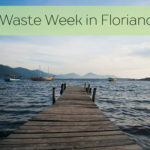 Zero Waste projects are not a utopia, in various parts of Europe. We can’t use our natural resources and keep on destroying our ecosystem, we are already today putting futures generations at danger caused by irreversible damages. 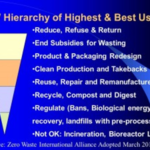 “Zero waste might be an ambitious goal in our highly industrialized societies; but it is the right aspiration” said Commissioner Janez Potocnik in the EU-parliament, Brussels, the 7th March 2013. I met Anders Wijkman from Club of Rome he’s been around for many years and is still full of energy for the world’s best. It is a different planet today compared with the 70: s, the first book they published was “The Limits to Growth” and the new book is called “Plundering the Planet” and the conclusions are the same: We have to slow down. The UN estimates sustainable development initiatives could create 60 million new jobs, with recycling being one of the eight key sectors of growth. Eco-innovation is a new market coming up fast, it is solutions that reduces the use of natural resources and decreases the release of harmful substances across the whole life-cycle. How can governments and business promote systemic eco-innovations and build circular economy? Metal and electronics are very important to recycle as much as possible to stop the global takeout – our world is full of these items. The landfills are full of metal, every city around the world has miles of cables in the ground that is not in use for anything, and to extract this, we call it “above ground mining”. When it comes to electrical and electronic equipment for recycling the potential is enormous and the waste generated in this area is gigantic. We need to collect more and recycle more because the production of electronics will increase in the coming decades at a rate of at least four percent annually which is more than growth of the municipality waste. I attended also a workshop called Liter of light – it´s about bringing light to homes in underprivileged areas with recycled plastic bottles. Sometimes small things do make a big difference. In this case all you need is an old plastic bottle, water, some bleach and sunlight. This will give light to millions of huts in the slum around the world; it gives people better life quality without having to use expensive or unsafe electricity – very smart and good example of new simple inventions. Today we have a fast urbanization and cities are the powerhouse of economic growth, the energy consumption, carbon emissions and use of natural resources. Soon 70% of the world´s population will be living in cities or mega cities; it also means that numbers of urban poor are growing fast. We need new and better design of cities because we have to take care of almost everything “in the city” to make the local economy strong. If we improve resource productivity and reduce the environmental impact we also contribute to the well-being of society. I had a separate speech about Kretsloppsparken Alelyckan during a session called; Resource Efficiency and Governance. The audience liked the smart idea we are working with and many people asked questions about the concept. I was happy to put Goteborg on the international arena again and also be able to promote the “park concept” which is a new conceptualization of reusing items bound for destruction. Where are we today, do we need to decouple economic growth and well-being from resource use and environmental impacts or can we generate growth which is both socially inclusive and environmental sound? Thanks to the organizers of a very professional conference, thanks Davos for being so outstanding and thanks to all my fellow waste warriors from all over the world. See you all in Peru next year and keep up all the good work you are doing.